FREE for a limited time – Teach Me Kindergarten, an educational app for young kids. It teaches addition and subtraction to 10, spelling (choose the missing letter), preK & K Dolch sight words, letter writing (upper & lower case), and number writing. The app includes parental controls which permit parents/teachers to choose which subjects they want and/or the level of difficulty. They can even choose specific questions. Up to 40 players can be entered and the topics for each player can be individualized – great for the classroom. Parents/teachers can review performance history for each subject to check how their children are doing. 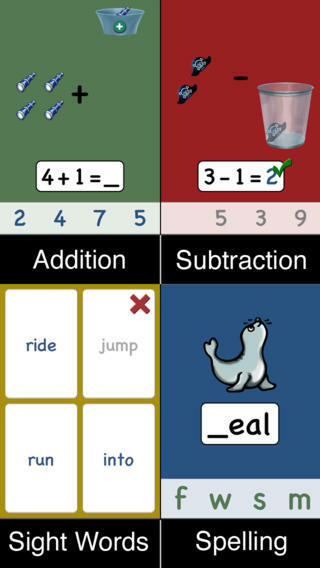 Also on sale for $.99 – Teach Me First Grade, another educational app from the same team. This app works the same way but teaches the following skills: first grade Dolch sight words, addition up to 20, subtraction down from 20, spelling of over 170 first grade words.